See the highlights of San Francisco on this exciting tour that combines a 6-passenger seaplane flight with a ticket to Alcatraz. Start your adventure with a 30-minute seaplane ride, a thrilling experience that takes you from the Golden Gate Bridge to downtown San Francisco and provides eagle-eye views of Angel Island, Fisherman’s Wharf and more. In addition, take the ferry to Alcatraz Island for a tour of the infamous prison; tickets to Alcatraz can sell out fast, but this tour guarantees you won’t miss out. Choose from two flight times, and depart for Alcatraz in the afternoon. 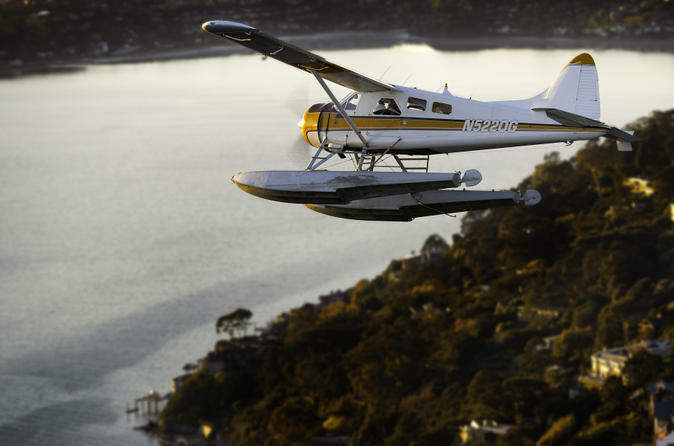 Your 30-minute seaplane flight departs from Sausalito, the postcard-perfect village across the bay from San Francisco. You'll take the provided shuttle from Pier 39. Choose from two morning flight times, depending on the date you select upon booking, leaving you time for the Alcatraz portion of your day. When you arrive, meet your experienced, friendly pilot and hop inside your 6-passenger seaplane, which provides large windows and high wings so you can enjoy great views and photo ops. Take off, soaring out to the Marin Headlands and the Pacific Coast and then back across the Golden Gate Bridge. Fly over the San Francisco Financial District, along the Embarcadero, past Fisherman’s Wharf and Pier 39, and over to Alcatraz. Zoom across Angel Island and past the waterfront towns of Tiburon and Belvedere before splashing down to Sausalito for an exciting water landing. Spend time shopping or eating in Sausalito, if you wish, before heading back to San Francisco by shuttle. Ferries to Alcatraz Island depart from Pier 33, which is a short walk along the Embarcadero from Pier 39 and Fisherman’s Wharf. Step aboard the ferry and enjoy the ride across San Francisco Bay, soaking up the panoramic views of the Golden Gate Bridge and city skyline along the way. The Alcatraz walking tour is independent and audio-guided, so when you arrive, just pick up your headset and begin your on-foot exploration of the historic prison. Cellhouse — the Alcatraz award-winning audio tour — provides fascinating narration about life inside the world’s most notorious penitentiary, including stories from former inmates themselves. Enter a real cell, see where prisoners ate and spent their time, and learn about the legendary criminals who ended up there such as Al Capone, George ‘Machine Gun’ Kelly and Robert Franklin Stroud. When you’re ready, leave the island at your leisure; ferries depart every 30 to 40 minutes to return you to Pier 33.